The price tag on the latest National Defense Authorization Act is $700 billion, which will cost American taxpayers nearly $2 billion every day in 2018. While the United States Congress has struggled to pass legislation governing taxes and healthcare, it had no problem uniting on the 2018 National Defense Authorization Act—a bill that will ensure the U.S. continues to wage wars around the world, and that promises taxpayers will cover its costly expenses. The price tag on the latest NDAA is a massive $700 billion, which means that for every day in 2018, American taxpayers will spend nearly $2 billion on war. House Majority Leader Kevin McCarthy, a Republican from California, claimed that by signing the NDAA into law, Trump “signed a bill that will make America safer.” He also noted one important fact—both Democrats and Republicans showed overwhelming support. Trump also specifically thanked Sen. John McCain for his contributions to the bill. The Republican from Arizona has been in office for 30 years, and has a reputation as a staunch supporter of war. The 2018 NDAA approves $634 billion for the Pentagon. This was done despite the fact that a recent report on the budgets of the Department of Defense and the Department of Housing and Urban Development, found that between the two departments, they have lost over $21 trillion in the last 17 years—enough money to pay back the U.S. National Debt. Nearly $66 billion will be allocated for the Overseas Contingency Operations fund, which ensures that the U.S. will continue to fuel proxy wars in foreign nations such as Afghanistan, Iraq and Syria. While advocates for the $700-billion NDAA claim that it will help to keep Americans safe, former Texas Rep. Ron Paul has noted that the more time the U.S. spends overthrowing governments and creating proxy wars in foreign countries, the more it should be worried about “blowback” from its reckless foreign poly. 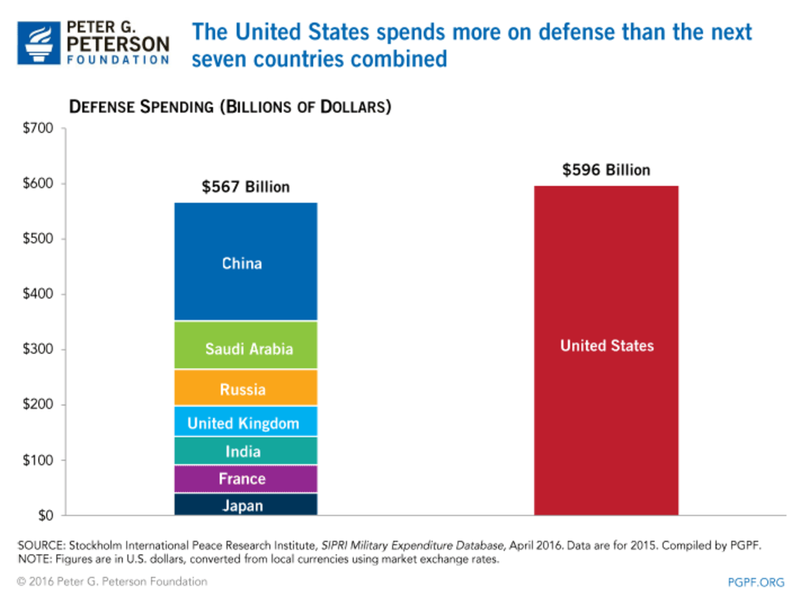 It should be noted that even when U.S. defense spending was under $600 billion in 2014, it was still more than the amount spent by the next seven countries—China, Russia, Saudi Arabia, France, United Kingdom, India and Germany—combined.